Harold Footitt was born in Carlton Scroop in 1914. His parents were Jack (an ironstone miner, born Gelston) and Elizabeth (nee West, born Glasgow). He had at least 7 older siblings. 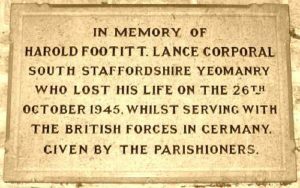 He died in Germany while serving with the Staffordshire Yeomanry, Royal Armoured Corps on 26 Oct 1945. This was 8 weeks after the end of the war. He was 31 and was buried in Hamburg Cemetery. We don’t know how long he’d been with the unit, but the Staffordshire Yeomanry, had fought in the Western Desert, including at El Alamein. The Yeomanry arrived back in the UK on 11 Dec 1943. At about the same time Harold married Ethel Parker. The Staffordshire Yeomanry tanks landed on Sword Beach on D-Day, 6 June 1944 and fought in Normandy until July, suffering heavy losses. They then converted to Sherman DD (swimming) tanks and took part in the Battle of the Scheldt and to cross the Rhine in March 1945.